There are hundreds of geocaches in the Conejo Valley, many of them along the trails in our open spaces! GEOCACHING is a real-world, outdoor treasure hunting game. Players try to locate hidden containers, called geocaches, using GPS-enabled devices and then share their experiences online. Enter a location and click the magnifying glass. Choose any geocache on the results page and click on its name. Geocaches should never be buried or placed in a location that might cause unnecessary concern. Don't place items such as food, explosives, knives, drugs or alcohol in a geocache. Geocache contents should be family friendly. Respect local laws and obey posted signs. Learn how to operate your GPS device and bring extra batteries. Select a geocache with terrain and difficulty ratings that will meet your goals. A (1/1) is easiest, a (5/5) the most difficult. Read the geocache description and don't forget the hints. It is also a good idea to bring a map. Remember that a geocache can take longer to find depending on environmental obstacles. Pack any needed supplies such as water, food and extra clothing. Invite friends and family with you; sharing the experience can be very rewarding. Let someone else know where you are going. Mark your car or a trailhead as a waypoint to ensure your safe return. 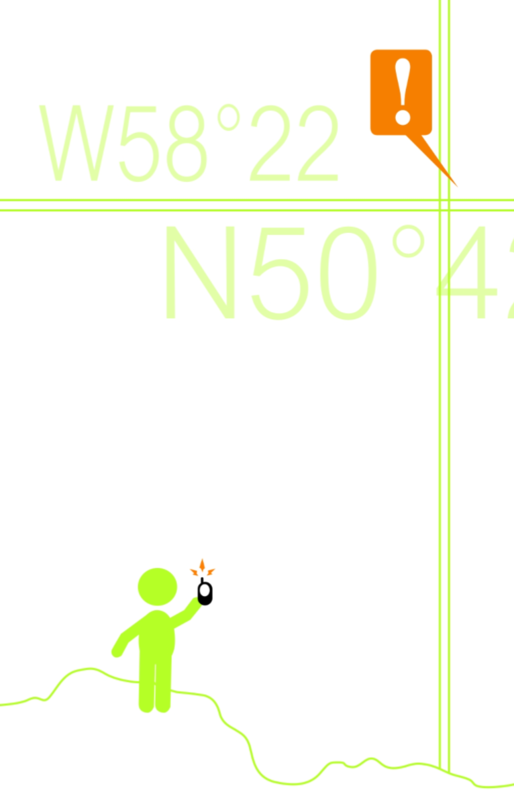 Rely on your eyes rather than your GPS device within 50 feet of the geocache location. Remember, geocaches are hidden in plain sight and never buried, but they are often very cleverly camouflaged. Be mindful of the environment; practice Cache In Trash Out. Leave the cache as you found it (hidden, of course). 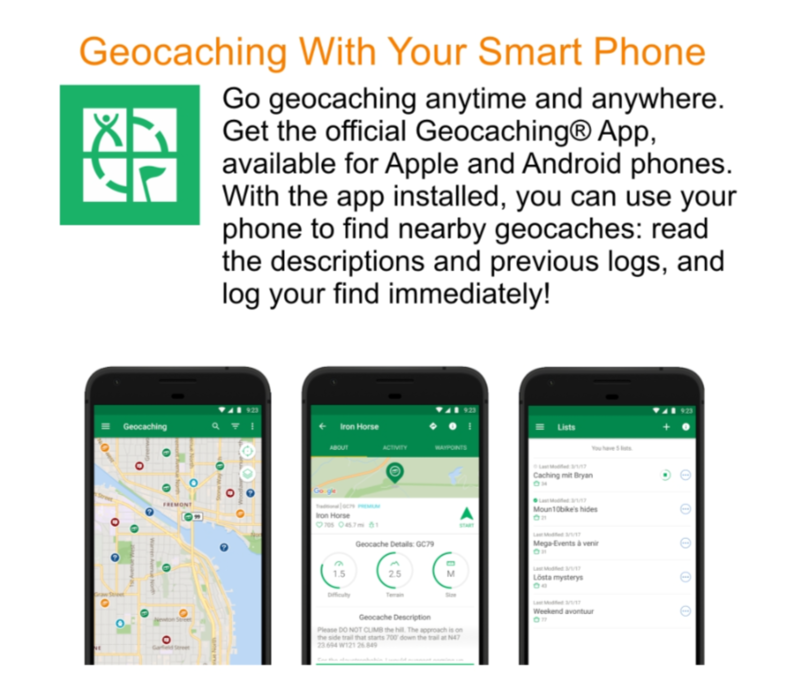 Share your geocaching stories and photos online at Geocaching.com. The original geocache type consisting of, at minimum, a container and a logbook. Coordinates listed on a traditional cache page give the cache's exact location. A Multi-Cache involves two or more locations. Hints found at the initial location(s) lead to the final geocache, which is a physical container. Mystery or Puzzle Caches can involve complicated puzzles you will first need to solve to determine the coordinates of the cache. A geocaching event organized by local geocachers or geocaching organizations in the interest of discussing geocaching. Coordinates on the cache page indicate event location. Cache In Trash Out is a worldwide environmental clean-up effort supported by the geocaching community. Since 2002, geocachers have been dedicated to cleaning up parks and other cache-friendly places around the world. Check the online event calendar to participate in organized clean-ups in your area.